Frankenstein is not a particularly linear game. There is very, very much traveling through a multitude of possible paths in Dr. Frankenstein's castle and grounds, with its many rooms, hallways, secret passages and tunnels, mazes, and doors that will open at times and will not at other times, and this path complexity increases the farther you get into the game. There is no doubt a most efficient pattern to accomplish the many tasks that must be done to rescue the monster and his daughter from the clutches of Frankenstein, but the available path variations are so numerous that this is difficult to determine. As in any Adventure game, there are of course many items that you must find and tasks that you must perform before you can do others, but they do not necessarily follow closely upon each other. There is a very complete game playing instruction book on the disk; however, I think a few extra words about the cursors might be in order. The right and left pointing hands normally turn you 90º in the direction of the pointing finger, but on occasion the turn is 180°, and it is up to you to determine if that is the case; in addition, these cursors are used to withdraw from a closeup, in which case there is no turn at all. The forward movement cursors are also pointing hands, either slightly left or right, not straight ahead; furthermore, the angle away from straight ahead is not always the same and may take you to a different location. You have to move the cursor slowly across the screen to detect this when it occurs. A case in point is the long pool in the castle courtyard. Despite the game’s age I played it on Windows XP with only one problem: at one point large chunks of ore are to be run through a pair of crushers until you get a full load of crushed ore in a cart–—something that you need to continue the game-—and I was unable to get any rocks to show up on the crusher conveyor belt to be pulverized by the two manually operated sequential hammers. I bring this up because I have been in contact with several other gamers who experienced this same anomaly, and at least one was using Windows 98. In some frustration while the empty belt was running in front of me, I began idly and alternately operating the hammers and suddenly three rocks appeared—–shaken loose, as it were, moving along and ready to be crushed. Repeating this, and occasionally turning the conveyor belt off and on, eventually—-and that is the operative word—-got me the cartload of crushed ore. It is to be hoped that you will not encounter this difficulty, or if you do that this unorthodox solution will work. The inventory is not very extensive, many items are used almost immediately, in which case they accompany your cursor until applied. Not too long into the game you acquire a valise to carry the few items that need to be transported. Most of these consist of various notes that turn up in a great variety of places; those that may be collected are stored in the valise in a single sheaf, and you must leaf through it if you wish to review them. Be sure and read these notes as you find them, because while many of them are of little import, others contain information that has much relevance to the conduct of the game. There are several instances in which the need for haste is expressed or implied, but the only one where I found this to be actually the case is at the series of ladders found beyond gate II, or if someone is gunning for you...Setting of gauges does not have to be all that precise...There seems to be a particular piece of music for each of the various locations—-a leitmotif, as it were-—and fortunately none of these is so loud as to interfere with any speech...Throughout the game there are comments by Frankenstein, but mostly by you, the monster; some of these are indications of what must be done, some are explanatory, and some gratuitous, frequently maudlin. Saving games can be something of a problem. At the time that the game was developed Windows file names were limited to eight characters (no spaces), and since the filename listing in the folder where the games are stored is alphamerical I chose to fill the first two places with a number in order to keep the list in time/action sequence, leaving only a restrictive six for some sort of abbreviation. My solution was to use the six as inventively as I could and to keep a separate cross reference text list in which I could describe the game storage situation without any limitation. One can, in fact, use the six character descriptor more than once since it will have a different sequence number. Games are stored in C:\INTRPLAY\FRANKIE with an .STA extension, and using Windows Explorer to access them you can manipulate them as any file, such as delete or rename. There are several places where you may be killed, so as in any Adventure game you should save often. As indicated above, there are a multitude of different paths through the castle and its environs, and the following walkthrough is but one of these. It is easy to loose track of where you are in the passages and hallways inasmuch as the views are frequently identical, so I have made several diagrams to assist in keeping track of your progress. Reference to these drawings will greatly facilitate your progress through the walkthrough, and you may well wish to employ them even though you are not using the walkthrough, although some annotations may be regarded as spoilers. You will note that the hallways and passages contain unevenly spaced dots; these are endpoints of the forward steps as you pass along these corridors. There is a lot of gaming on just one disk. And it is pretty good. The game begins, as do most Adventure games, with an introductory video to establish some story background. The time is the latter part of the nineteenth century, and with lightning flashing over Frankenstein's castle a narrator states that you, Phillip Werren, have been accused of murdering your daughter Gabrielle; protesting your innocence, you have been found guilty and hanged, with your body torn apart by an outraged mob. You then come back to consciousness looking up at a ceiling, with Dr. Frankenstein leaning over you and congratulating himself on creating life. He gives you a shot of something that “will make you feel better,” then gives himself one. The cursor appears; click and one of your arms comes into view, click again and the other arm shows—to your horror Frankenstein has given you a woman’s arm. One more click and the doctor is at a control panel urging you to stand, which you do, finding yourself in a laboratory in Frankenstein's castle. This room where you have returned to life is the Resurrection Laboratory. As indicated in the subtitle, you are playing this game in the persona of the just brought back to life “monster”. page containing an article about your sentencing judge, find a bookcase that can be moved to reveal an opening blocked by a locked grate, and if you look hard, a dumbwaiter. You can also find on a shelf a glowing green lifestone crystal, below which are some of the doctor’s working notes. You will have to leave these items for now—–but remember where they are. Attached to the wall to the right of the greenboard is a ladder that you may climb to the castle’s upper parapet where you will see a strange looking kite. On the parapet wall is a plaque bearing the Roman numeral II and showing an orbital planetary arrangement that you must carefully note. Nothing to do up here at this time, so return down the ladder. When you have finished looking around the Resurrection Laboratory, find a trapdoor in the floor below the periodic table chart. Click on this door to go to the room below, which is mostly occupied by a very large Tesla coil, named after its Serbian inventor, the early electrical engineer Nikola Tesla. This device is an electrical transformer that can change both the frequency and magnitude of an alternating electrical voltage; it is here [erroneously] used to store electrical energy from lightning. You can find a knife switch for this device, which is in the down position. Leave it that way. Near the foot of the stairs is a door leading out to the castle lower parapet, where there is a v-shaped break in the parapet wall. Looking down from this break you can see a barred window in which the remnants of the bars have been have been blown outward. Turn around and observe the tower, then go to the wall between the two hanging white ropes, where you will find three canon balls. Place one of them on the hoist platform on the left, then pull on the rope at the right and watch as the hoist lifts the canon ball and tilts it onto a shelf, where it rolls until it goes off the other end. Noises of falling objects are heard. With the hoist back down, looking to the left there is now on the deck what appears to be moose antlers, or perhaps a statue of an eagle in flight, in which a rope is entangled. It is not tangled all that much, because you can take an end of the rope off to the right and cast it through the notch in the wall. T he rope must have become wedged in the notch because it will support you as you climb down and go into the room behind the blown out grate. Once inside turn right and you can make out a ladder. Call this secret passage #1. Go down the ladder until it changes aspect and color. Turn left and you will see a room in which is a table with a red mess on it (it is the remains of a cadaver); don’t bother going in as the door that you can see behind the mess is locked. Turn left again to observe two tables and a candle; the monster (you) says that here is a place that he can do some experimenting about which the doctor will be unaware. Return to the ladder and go the bottom. Turn right to be confronted with a crank above which is a set of five different sized gears; study the gears so you will know their relative positions. Turn the crank and a panel in the wall on the right begins to move, whereupon the top three gears fall. They don’t fall far; you can pick them up and put them back, easy if you have studied them as suggested. Anyway, there are only three gears to remount, how hard can it be? With the gears back in place, continue turning the crank to complete the panel movement and enlarge the opening, then go through it to emerge from behind a tapestry into a large room. You are in the Great Hall of the castle. Go through the double doors at the far end of the Hall and into the banquet room. Turn right and go to the fireplace to pick up the valise. This is an important item because it is where you will carry your inventory. Open the valise to read three pages of Dr. Frankenstein's research notes. Turn left and you will hear a door open, footsteps, and the door closing. Turn left again to see Frankenstein at the far side of the room. Go toward him and he makes some remarks about dead tissue, then turns away. Approach him again and he leaves. Turn to face the table, then move forward once on its right side, face it again, and go forward to pick up the turkey leg to use in an experiment. Put the leg in the valise, turn around, and go through the doors back into the Great Hall. Move to the tapestry at the far end, lift it, and go into secret passage #1 by the gears. 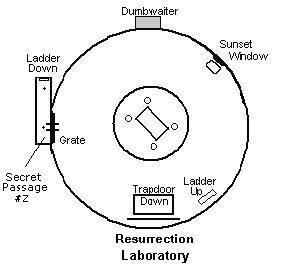 Proceed up the ladder and the rope and stairs all the way to the Resurrection Laboratory. Go to the shelves where you saw the lifestone crystal, which you need for the experiment that you are planning, but of course Frankenstein will not let you have it, so you must devise a way to get it out without him knowing it. He can be seen working at a desk and glancing at you occasionally. At the times when he is concentrating on his work, pick up two sets of his notes from the shelf below the crystal and put them in the valise, then grasp the crystal and very quickly turn right to the window displaying a red sunset. If Frankenstein apprehends you in any of this activity he will admonish you, more severely each time that he catches you, and the fourth time he will shoot you, thus ending the game unfavorably. However, it is not difficult to gather these items unobserved and to put the crystal on the table on front of the sunset window. Then you must acquire the cloth from the bottom shelf at the right and place it on the table next to the crystal. Take four pieces of string from the bundle on the wall and click them on the cloth and you will have formed a parachute for the crystal. Click this on the window, and very improbably an updraft carries it to the tower that may be seen in the distance (not over the wall as the monster says). You will retrieve the crystal later. If in your hurry you have not yet read the research notes that you just acquired, now is a good time to do so. Leave the Resurrection Lab through the trapdoor below the periodic table chart. The cursor will indicate that you can continue down, but if you look downward you will see that the steps are broken. Leaning on the steps from the lab above is a dimly perceived board that you may place on the broken part of the steps. Before you take the board, look in the wooden box to the right of it for some more research notes. Read these at this time because for some reason you cannot put them in the valise; perhaps they are unimportant. Grasp the leaning board and place it on the broken steps, then go down to the room on the next level. This is another laboratory called the Frost Room. Here you are facing a locked door, a fact that you may determine by clicking on it. Turn left and move forward to find the frost that gives this lab its name, though the reason for its existence is not apparent. Click on the frost; it is sealing the door behind it shut. The view as you turn left is of equipment on a laboratory bench; go to this bench to examine it. The first thing to do is to lift the rightmost of the four knife switches. Loud noises are heard; what you have done-—though you have no way of knowing it-—is to turn off the machinery that maintains the frost, and you must now wait for it to melt. While waiting you can investigate the other items on the bench. Or you can just wait. Pick up the loose wire on the bench and attach it to the open terminal on the bottom of one of the other three switches. (The wire appears to still be loose on the bench, but you can see a wire on the terminal.) Pull down the switch handle to observe what happens. Take the wire from the switch and repeat on another, then again on the third. While the foregoing is optional, you must take the battery from atop the glowing green one at the end of the bench and also the coils of wire hanging on the wall. Put both of these items in the valise. Turn back to the frost, which may or may not have melted, and continue turning to see Dr. F in front of the locked door that you encountered when you came down the stairs into this room. (If he is not there, look around while waiting some more and he will show up.) He tells you that the door is to your bedroom and that the key is in the drawer of the table. Go right to find the table and get the key; in the drawer is a note to read, another that won't go into the valise. Carry the key to the bedroom door and click it on the door to unlock it and enter. Look around this small room. In a corner is a wooden cabinet; open the cabinet door and discover there is no back to the cabinet. Clearly this is something to investigate, but not now. Turn to go back to the Frost Room, and Dr. F appears in the doorway for some more remarks, after which he leaves. Follow him out. By now the frost has melted and you may open the door that it had blocked. In this room, a chemical storage room, you can find a prybar to put in your valise, and two sets of notes as well. There also is another door, this one has a handwheel on it, but it is locked. Get a closeup of the lock below the handwheel; it appears to be a matter of setting five sliders either up or down in the correct combination (120 different possibilities). You have by this time collected everything that you need for your intended experiment except the all-important lifestone crystal, and you must therefore find a way out of the castle proper and into the courtyard to the tower where you saw the parachute deposit it. The exit door is in the Great Hall. You of course know the most direct route to get to that room: back up to the lower parapet, down the rope and the secret passage ladder, and out past the gears and the tapestry. However, there may be an alternative: the backless cabinet in the bedroom. You have much to learn about this castle in your effort to get away, so unless you are in a hurry it is probably a good idea to pursue this latter venue. Going through the cabinet puts you in secret passage #2. If you turn left upon entering this passage you will be able to look through the back of a picture to see into the bedroom that you just left, and through a grate to look at the chemical storage room, but they are both empty and you have been in each, so there does not seem much point to it. Turning right instead of left takes you immediately to a tee in the passage; going right from there you come to an upward leading ladder. Click the upward pointing cursor twice and turn away from the ladder, whereupon you will see another grate. Looking through this grate shows the Tesla coil and little else, so return to the ladder. Again click the upward pointing cursor twice and turn away from the ladder. Following the revealed passage takes you to a different kind of grate, one that you can open. Click on the latch to do this and you see the back of a bookcase; click on that and it slides to the right. You are looking into the Resurrection Laboratory from the grated opening that you discovered earlier behind the bookcase that could be moved aside. Move forward once for a better view. You can see many of the items that you looked at after you became conscious on the central table with Dr. Frankenstein leaning over you, but more importantly you get a new perspective on the table itself: it is situated in a depressed circular section of the floor on a platform suspended by chains from four pillars, and it appears as though the this platform may be raised and lowered. You just may have noticed these pillars and chains when you first became conscious staring up at the ceiling of this laboratory. You could move into the Laboratory, but you have already examined it and are not likely to find anything new, so return to the ladder; however, if you do go into it you will find the grate no longer locked and you may return to the secret passage. Whatever, go to the ladder, then go all the way down to the area where you first entered this secret passage. Leaving the ladder, follow the passage straight through the tee, and after a couple turns you will come upon another grate from which you can see a room that is unfamiliar but is full of laboratory equipment. Follow the passage to another tee, and after turning right here you will eventually come to a plaque affixed to the left wall. (There are two more of these plaques, but as it turns out they have no bearing on the progress or solution of the game. Their purpose will remain a mystery.) After the plaque you will find one more grate, again looking at an unfamiliar room, this one containing a telescope. Not surprisingly, Dr. Frankenstein appears to have an observatory. Passing the grate you encounter a dead end, so go back to the tee and through it to find a ladder going down. Climb down this ladder to secret passage #3. Turn away from the ladder and move forward once—you are at a tee in this new passage. Turning right and following this branch for a bit you find yourself at the rear of a fireplace in which a fire is burning brightly. Clearly you cannot proceed further, so go back to the tee and move to the right. You will encounter a scaffolding barrier blocking the passage, but very fortunately you are carrying a tool to take care of that. Get the prybar from the valise and click it on five of the barrier nails and the boards will fall away. Put the prybar back in the valise and move onward, and after several turns you will come upon another of the mystery plaques displaying a line diagram. Immediately following there is second scaffolding barrier for you to treat as you did the first one. After three more turns the passage takes you to yet another ladder to go down to secret passage #4. Following this passage away from the ladder, after many turns—six, in fact—your way is blocked by a jet of steam from a pipe each time you try to pass it. Looks as though there will be a long trip back. During this return you will find a third line diagram plaque. However, just before you get to the ladder going back up to secret passage #3, there is on the left wall a lever, which when pulled down moves back some bricks in the wall, and when you crawl through you find yourself in the Great Hall, which is where you want to be so you can go for the lifestone crystal. Turning around and moving the wall torch also opens the bricks. Go through the double doors opposite the Great Hall stairs and you will be in the courtyard, where on the far side is the castle gate and the tower where the lifestone crystal landed. Move to the edge of the brick paved area and look outward. 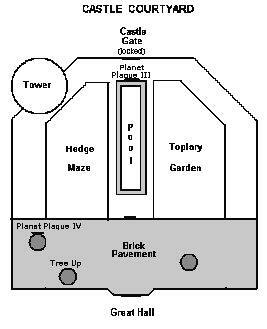 On the left is a hedge maze and on the right is a topiary garden, with a long narrow pool separating them. Turn left and move along to the tower. On the way you will see a rope lying on the bricks under a tree, but you can’t make use of it now. Later, undoubtedly. At the tower look upward to see the crystal glowing up there. Click the upward cursor on the tower to produce an upward view of the tower showing a couple stones protruding from the wall. Climb the tower by clicking on the stones that produce the upward cursor; when you get to the screen showing two of these, keep to the left. When you can reach the crystal (without the parachute), put it in the valise which you have kept with you during this somewhat precarious ascent. Climb back down by clicking on the stones showing a downward cursor. You have what you need for your experiment, but before you return to the hidden room in secret passage #1, go to the castle gate and turn right to look at the long pool between the two foliage sections. In the end wall of the pool is to be found another of the planetary position plaques, No. III. Now note the slight difference in forward cursors for going along either side of the pool, and there is yet another: move forward once on the left side, then move the cursor slowly to the right so that it is above the pool—-this is not the previous right poolside cursor. Click it and a statue of a goblin on a sphere is shown in the pool; click on the sphere and the statue lowers in the water. Move forward and a door to a tunnel opens in the wall ahead. Go through the door. Move ahead through the tunnel, soon coming to a dock that is just inside the mouth of a cave looking out at a large body of water. Advance to the edge of the dock and turn left, avoiding the down cursor. On the dock is a battery with a loose wire, and on a table directly in front of you is a brown spherical object that is a diving helmet. Click on the helmet to don it, and be sure to take the spear gun that is yet on the table. Connect the wire to the battery to start the noisy air compressor, then turn right and use the down cursor on the ladder at the left to enter the water. Turn right to see a piece of paper on which are twelve names, right again to be attacked by an octopus that is automatically dispatched by the spear gun. Right once more to find a box filled with gold bars that may be seen but not taken. Turn left and go up the ladder to the dock, where you will be facing the exit tunnel. Click on the tunnel to remove the helmet and approach six logs forming a bridge that you may cross to enter the tunnel. Move forward, taking the tunnel on the left back out to the long pool, opening the gate with the lever on the right wall of the tunnel. You still have your experiment to do, so go the length of the pool, turn left, and go past the tower back to the castle. On the way back examine the rope under the tree; clicking on it causes one end to rise like a cobra, then fall back. Curious. In the dirt at the base of the tree is another planetary plaque, No. IV. When you get to the secret room in secret passage #1, the paraphernalia collected for the experiment of infusing life into the turkey leg appears spontaneously on the table with the candle; this must include the illustrative sheet of Frankenstein's notes that you acquired at the time you took the crystal. Connect the wires from the battery to the ends of the lifestone crystal, which shortly begins to glow, then goes dark. Very despondent soliloquy from the monster, who believes the experiment failed, the turkey leg disappears as he takes it to satisfy his hunger, and the screen goes dark. Sounds of vomiting, and when the screen lights up again, bits of regurgitated food are on the table. Pieces of chewed turkey leg move away, indicating that the experiment worked after all. What this peculiar incident is probably supposed to illustrate is how to use a lifestone crystal to irradiate dead tissue so that it is again alive. From a new perspective after the vomiting, there appears at the foot of a table a previously unseen grappling hook for you put it in the valise. From previous remarks made by the monster, a good bet is that it could be used with the rope under the courtyard tree, so return to that location. However, it would seem that Frankenstein has discovered that some of his research notes are missing, and when you leave the Great Hall for the courtyard, he appears in the doorway, threatening and demanding the return of his notes. Curiously, he makes no mention of the lifestone crystal. He goes into the castle and you follow him in for more threats, after which he leaves. Go back out to the courtyard and to the rope lying beneath the tree. Click the grappling hook on the rope, whence it becomes affixed to the rope end, then click on the hook and it rises to attach itself to the tree limb outside the open castle window. Climb the rope and go through the window. You are in the castle Trophy Room, as attested by the several mounted game animal heads. Ahead is a door; if you try to use it to exit the room the suits of armor on each side of it become animated and bar your way with their axes. Even though Frankenstein is elsewhere in the castle, you can hear him continually demanding his notes and making dire threats. Turn left and you can see another note on a table against the wall under some trophies. This one is a rather incriminating one written by your sentencing judge, but does not go into the valise. Turn left twice to see the fire that you came upon when exploring secret passage #3. Since it bars the way to a secret passage, perhaps you should out it out. To the right is a glass tank of water on wheels; use your cursor to locate and remove the piece of firewood blocking one of the wheels, then click on the tank to move it under the chandelier. Move close to the fireplace and click on the reel of rope supporting the chandelier. The rope will unwind, dropping the chandelier and breaking the glass tank. The resulting flood of water will extinguish the fire. You can now go through the fireplace, but you have already explored that secret passage. Go back to the door and place the black table against it. Now when you try to go through the axes become embedded in the table, and you can exit to the second floor hallway. Move forward and go around the corner to the left. The hall extends quite a way ahead; move that way four times and you will find an unlocked door on the right. The room inside this door has suffered damage, mostly from fire. The only thing of note here is another planetary plaque, No. I. Leave the room and continue on down the hall. When you come to the end, go right, forward, left, and forward. You need not proceed further, as all the doors ahead are locked. The door on your left, however, is not locked. Go through this door and up the stairs to the third floor hallway. All the doors in this short hall are locked except the one you just came through and the one in the alcove around the corner to the right. When you enter this room, immediately in front of you on a table are two more notes. Looking around this room with its globe, astrolabe, and books you can conclude that it is Frankenstein's study. Turn to the right, go to the bookshelf, turn left and you can see his telescope, so the observatory is attached to the study. Looking through the telescope shows nothing that you can recognize, nor is anything to be found in the many books, so return down the stairs to the second floor hallway and back toward the Trophy Room. Just before you get to the end of the hall (before you turn to the Trophy Room) you will find an alcove on the left with an unlocked door at the end, when you go through this door and glance around you will realize that you have entered the castle library. Click on the double eagle heraldic shield on the left to get the axe from behind it, then use the axe to draw the rolling library ladder to you. Go down the ladder to the library floor. The first thing you see are two sets of notes for you to read and put in the valise. Look around the room for two more sets. In the course of this search you will doubtless find a trapdoor, but it is locked. One other thing that you must find-—and it is not all that easy—-is a set of small green scales, or balances, on the end of a lower shelf. On one pan is a skull shaped weight, move it to the other pan and you will open the hidden door to the other end of secret passage #4. Following this passage you will arrive at the steam pipe that puts out a jet of steam as you attempt to pass it, but here you can reach the valve that shuts off the steam. Do that, and continue past the steam valve until you get to the lever that will open the hole in the wall and let you into the Great Hall. Frankenstein is here waiting for you, frustrated and very angry indeed. He tells you that he has waited long enough for the return of his notes, and he is going to kill you permanently if you do not do exactly as he orders. (He has a gun and will use it if you don’t do as he says; try it and see if you wish.) He then begins a series of step-by-step peremptory orders that take you back to the library and down through the now somehow open trapdoor to the dungeon, where you are shackled to a wall. A shadow shows you being whipped, after which Frankenstein leaves. Curiously, in the valise you still have the notes he wants. Look at your woman’s left arm in its shackle. This arm is small enough so that it can slip the shackle when you click on it. Click on the right shackle; that hand is too big to slip out. Turn back to the left shackle; a key is mysteriously lowered on a string. Take the key, and with an unshackled left hand you can use it to unlock the right shackle. You are free! The trapdoor dungeon entrance from the library at the head of the stairs to the right of the skeleton is locked. However, to the right there is a grate in the wall that may be opened, behind which is a tunnel leading to a chamber that has two tunnels as exits. Of these, the right tunnel takes you to secret passage #4 in the castle adjacent to the ladder going up and the lever that opens the wall passage to the Great Hall; however, when in the secret passage there is no evidence of this tunnel and you cannot get back into it. From the chamber the other tunnel going straight ahead takes you to yet a different chamber, again with two tunnel exits. The right one takes you to a gray ladder and up to the topiary garden, and the left one to a brown ladder and up to the hedge maze. 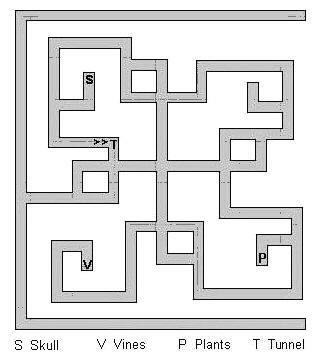 As it happens, you have to get to the maze, so that is the way to go; if you take either of the other two tunnels you would still have to find your way to the maze. You end up at the bottom of a ladder, to the right of which is a lever arrangement similar to the one in secret passage #4 that opens the wall access to the Great Hall. Well, pull it, that’s what levers are for. Rumblings are heard. You may well wonder what has happened, and you can check it out: go back up the ladder, move forward toward the dimly seen castle, and climb the ladder to the paved area of the courtyard. Turn around and move to the edge of the paved area; you will see that a corner of the maze has been rearranged so you will not have traverse the entire maze again should you have to go through it. Retrace your steps back down the ladder and to the just pulled maze configuration control lever. Go through the tunnel next to the lever and up the ladder. 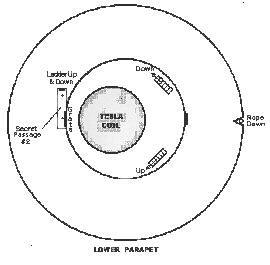 Still underground, you are in the planetary control chamber with the control unit affixed to the wall. Take a moment to look around, and you will see four heavily barred gates identified by Roman numerals. Get a closeup of the control unit, noting the lever on the right. Clicking on the handwheel causes it to rotate, as do the planets at different orbital speeds in the planetarium on the left. Click on the handwheel again to stop the rotation. Below the handwheel are eight covers that may be slid back two at a time: one in the top row that displays symbols, and one in the bottom row that displays Roman numerals. It may be observed at this point that for centuries the ancient alchemists believed that there were but four elements: fire, water, air, and earth. Behind the upper row of covers on the control unit the stylized symbols are icons of flames, waves, wind, and mountains; the four element equivalencies are apparent, mountains being of earth. Now consider the four planetary plaques and where you found them: plaque I in the fire damaged room, corresponding element fire; plaque II on the upper parapet with the kites and the wind blowing, corresponding element air; plaque III on the end of the long pool, corresponding element water; plaque IV in the dirt at the base of a courtyard tree, corresponding element earth. What you must do is regard each plaque in turn and bring the three control unit settings in agreement: open the lower cover to the Roman numeral on the plaque, the upper cover to the corresponding symbol as indicated above, and using the handwheel set the positions of the planets as shown on the plaque. Pull the lever on the side of the control unit, and if you have set all correctly you will hear the sound of the matching gate opening. It would be convenient to go ahead and open all the gates, but only one gate at a time may be open. You need not open the gates in numerical order; in fact, you should open gate IV to the mausoleum at this point, because there you will find many notes containing information and directions that will be needed elsewhere. Of the eight covers on the planetary control panel, open the one on the bottom right to show the Roman numeral IV, and the one above it to display the corresponding icon for earth, then manipulate the handwheel until the planets are in the arrangement that you carefully noted when you found the plaque in the dirt at the base of the tree in the courtyard. When you think you have duplicated the arrangement, pull the lever on the right of the control unit; if you are indeed correct you will hear sounds of movement, that of gate IV rolling back. door in the castle chemical storage room with the unlocking slider positions indicated. As you read all the notes the plot thickens. Return to the planetary control unit and open gate I. Slide back the appropriate control panel covers and set the planetarium configuration to that of plaque I, and click on the lever to hear gate IV close and gate I open. After you enter this gate you may wish to do some exploring. To the left just after entering is a tunnel at the end of which you will find a stone framed opening with red and black pushbuttons on the left, and looking closely inside the plates of a conveyor belt may be seen. The buttons have no effect at the moment, but you will have to come back here soon. Back off and turn left to see a wall other than dirt; a cool breeze is detected. Go back toward the entrance and continue on into the tunnel where you will soon come upon a chamber showing three openings. Here on the shadowy floor is something that you might at first take for a sea creature, but in fact appears to be a disembodied hand that can move and speak, but cannot be understood. It slowly crawls away through the right opening of the three. The left opening leads to another locked door, and through the center opening is a conveyor belt identical to the first. Follow the hand through the right opening and note that immediately after you do you can hear running water. Move forward twice more and you will be in another three-doored chamber identical to the first except that there is a rock in this one. Here is the hand again; click on it and it crawls away through the left opening. Once more there is a conveyor belt behind the center opening; the right opening brings you to a blank wall. Turn around and go back through the tunnel to the spot where you heard the running water. 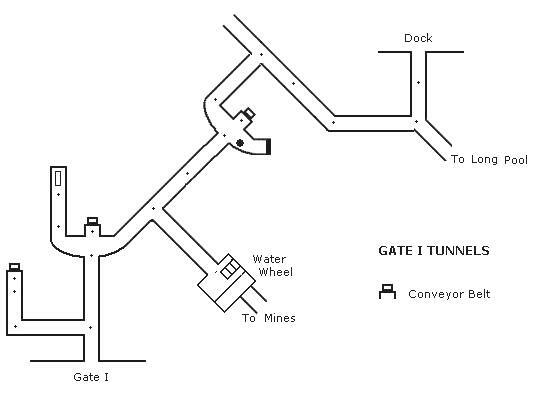 Turn left here and follow the tunnel to a slowly turning water wheel, you should have one of the doctor’s notes in the valise about this being the source of power of his mining operations. Behind the wheel is a large door chained shut. In the foreground is a horizontal pipe in which is a handwheel controlled valve. Click on the handwheel to turn off the flow of water and the wheel stops turning. You can now go across the wheel to the door. Look down to the chain on the floor; click on it and an end rises and hangs in the air, then you are holding a few links. Carry the links to the water wheel where the chain becomes attached, then cross the wheel to the pipe and click on the handwheel to restart the water flow. The turning wheel noisily pulls away the door providing access to a tunnel behind it, and after a bit the waterwheel continues turning as before. Cross over on the fallen door to the large switch on the wall next to the now open tunnel and pull the switch handle down. You will hear an industrial noise as power is applied to the tunnel complex. With power now available, return to the three conveyor belts that you saw in the tunnels and use the black buttons on each to start them up, whereupon you will see rocks moving by—–the same rocks in all three, passing again and again. Go back to the waterwheel, proceed across the fallen door, and through the tunnel behind it to the end, then turn left and follow the rails to a metal gate. Raise the gate using the lever on the right, and you will see a ladder and a cart on the rails below a hopper. Go up the ladder and move ahead to the pulverizer, which is the end of Frankenstein's pitchblende mining operation that he described in one of his notes. Pitchblende is an ore containing a large percentage of uranium oxide. Go a step farther, and to the right of the tripod at the rear of the cavern you can see one more conveyor belt just like the previous three; energize it with the black button and again the same rocks flow past. Step back from this noisy unit, turn right, and move to the white box on a post, which turns out to be the pulverizer master switch. Press the black button and heavy duty motors may be heard to start up. When that noise dies away the pointing cursor will indicate a unit to the right; click on it and you will be at the pulverizer controls. In the valise notes you should find a nasty letter from Frankenstein to Mario, the pulverizer operator, with some instructions on its operation, unfortunately not detailed ones. Pull the knife switch toward you and the pulverizer conveyor is set in motion transporting large chunks of ore under the two hammers, the left one operated by the red button and the right one by the black button. Every ore chunk must be struck by both hammers in order to pulverize it enough; should you somehow miss and a piece too large gets past, the machine shuts down and you must clear it by going to and pulling the lever that is located off to the right—–mentioned by Frankenstein to Mario—–then begin again by going to the master switch, resetting it by pushing the red button, then restart by pushing the black one. Go to the control and continue crushing, and when you succeed in getting enough crushed ore for a full cart load, the conveyor stops and you will hear the ore slide into the cart. Go down the ladder and check the cart; if it is filled you can see ore above the cart end. Go back along the tracks a couple clicks to the tunnel entrance from the waterwheel on the right. Travel through this tunnel, past the waterwheel and the rest of the tunnels to the planetary control panel, where you must open gate III on order to get into the refinery. At the planetary control panel, to open gate III use a similar procedure that you used to open gates I and IV, sliding back the control panel covers to show the Roman numeral III and the icon for water, and setting the planetarium to the pattern of plaque III. With the gate open move to stand in the entrance. 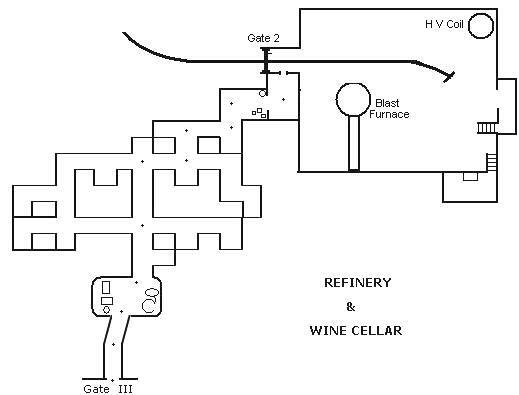 You now have to navigate the relatively simple maze of the wine cellar: go FFFFFRFLFRFLFRFL and pass through the square opening in the masonry wall. You are now in Frankenstein's ore refinery, and to your left is a closed metal door blocking the ore cart entry. Click on the lever on the right to open the gate and move through to face a tunnel wall. Turn left and proceed along the tracks unit you get to a track switch lever on the left just before the end of the track. Pull the lever to shift the track so that it leads into the barely discernable tunnel on the left. Should you travel down this tunnel you will find a ladder going up to a firmly closed trapdoor from which a chain is hanging. Pulling on the chain does not budge the trapdoor. Return back up the track and you will shortly see on the right side of the track a desk-like stand with another track switch lever next to it. Click on this stand and you will be placed behind it; it is a control for moving the ore cart. The cart is self-propelled and somehow gets its movement signals from the two knife switches on the stand. 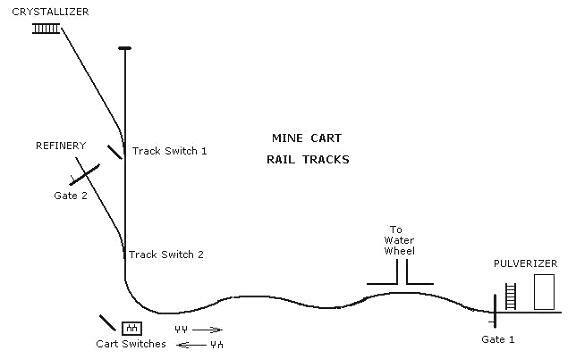 Pull the left knife switch down, whereupon the ore cart comes from the right where you have filled it with crushed ore in the pulverizer, and disappears into the distance down the track. Follow it and you will find resting below the trapdoor. Click on the hanging chain to fasten it to the cart. Go back to the cart control stand and set the switches (both down) to bring the cart rolling back and disappearing to the right. Now pull on the lever at the stand’s left and see the tracks turn to lead left into the refinery, then pull the left knife switch down, whereupon the ore cart comes from the right and disappears into the refinery. Follow it in. You may wish to briefly look around. In one corner there is a high voltage coil on the base of which is a knife switch that must be placed in the up position before you leave, but not right now. (Down is for the refinery, up is for the Crystallizer.) The most prominent item is a large barrel shaped unit that in the letter to its supplier Frankenstein calls a blast furnace. Unseen above is a mechanical arm called a claw. From a position behind the cart you will see two stairs. Go up the one on the right and in the room at the top turn to the table, where from the right hand drawer you can get several important notes that include diagrams delineating the controls for the refining process and for the soon to be used Crystallizer. It would be a good idea to have copies of these notes and diagrams so that you will not have to keep retrieving them from the trunk. Leave this room and go up the other set of steps, then turn and get a closeup of the refinery control panel. The refining process on the refinery floor is viewed through a protective screen to the right of the panel, and is straightforward: place the pitchblende ore in the temperature controlled furnace, apply a short period of electricity, and remove the refined ore. You may wish to consult the above suggested control panel copy as you go through the following steps. Note: There are couple discrepancies between the sketch and the panel itself, but these are of little consequence. Apply power to the system by pulling down knife switch (#1 on the copy) on the upper left. Pull down the larger bronze knob on the left side of the panel (#6), the vertical claw control. The ore transport arm moves to the cart. Move the knob back up. The claw grasps the ore and raises it. Move the smaller bronze knob (#7), the horizontal claw control, from left to right. The arm moves the ore over the furnace. Pull the vertical claw control knob down. The arm puts the ore in the furnace. Move the vertical claw control knob up. The claw withdraws empty from the furnace. Set the temperature of the furnace by moving the semicircular pointer next to the temperature gauge (#3) until the gauge needle is next to, but not into, the red area. In a scribbled note found in the library, under the heading High Voltage there is a series of numbers, the last three of which—80, 85, 90—are encircled. Use the large tan knob at lower left (#4) to set the voltmeter (#5) to 80, 85, or 90. Pull down the electrode switch (#2), the knife switch at top center. There follows a brief harsh sound. 10. Pull the vertical claw control knob down. The claw enters the furnace. 11. Move the vertical claw control knob up. The claw retrieves the glowing refined pitchblende from the furnace. 12. Move the horizontal claw control knob from right to left. The arm moves the pitchblende over the cart. 13. Pull the vertical claw control knob down. The pitchblende is placed in the cart. 14. Move the vertical claw control up. The arm moves up out of the way. Leave the control room and exit the refinery to the cart control stand, being sure that before you do you have thrown the switch on the high voltage coil to the up position. At the cart control set the switches to bring the cart rolling out of the refinery and to the right toward the pulverizer. Click on the track switch lever to change the track direction away from the refinery. Now set the switches to send the cart down the track past the refinery; follow it down to find the trapdoor on the ground and the cart parked below the trapdoor opening. 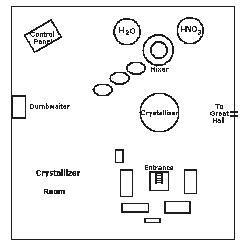 Climb the ladder into the Crystallizer lab. The equipment in this laboratory can be confusing until you sort it out. Some of it has been mentioned in Frankenstein's notes, and you have the control diagram that you found along with the refinery control diagram. Around you as you emerge from the trapdoor are racks of equipment that have no function other than to locate this entrance. In front of you is the Crystallizer unit, and behind it is the mixer over which are spherical tanks of water and nitric acid (HNO3). In the left rear can be seen the equipment control unit with cables running to it on the floor, and on the right a door that opens to the Great Hall. Another mechanical arm and claw is attached to the ceiling, and out of sight in the wall to the left is the Resurrection Laboratory dumbwaiter. Your task is to use the refined pitchblende to make a lifestone crystal, though what is wrong with the one that you already used is not stated. Perhaps they may only be used once. Move from the trapdoor entrance to the control panel. 1. A knob at upper right (#2 in the sketch), the claw control, has T-shaped movement slots. Move it to the right and the refined pitchblende is retrieved from the cart below the trapdoor by the mechanical arm. 2. Move the knob to the left and the arm places the pitchblende in the mixer, then returns to its rest position. 3. Maneuver your way around the equipment so that you are looking directly at the mixer with the two labeled spherical tanks at either side. The best way to do this to return from the control panel to trapdoor (look for the equipment racks), then go past the right side of the Crystallizer. 4. There is a valve at the base of the water tank where the hose joins it. Click on this valve and a measured amount of water flows into the mixing vat. 5. Do the same with the HNO3 acid tank to add acid. 6. Lift the knife switch on the vat support leg directly in front of you. The mixer blades descend, stir the mixture, then rise out of it. 7. Click on the drain valve at the bottom of the mixing vat. Mixture flows into the adjacent tall container. 8. Return to the control panel (via the trapdoor). 9. One of Frankenstein's notes says to use 80 volts to crystallize lifestone. The digital voltmeter (#6) registers 45 volts. Use the voltage control knob (#7) below it to raise it to 80. 10. Move the claw control knob to the left. The arm and claw picks up the mixture filled container and returns to its rest position. 11. Pull down the larger black knob (#4). The arm puts the container upright in the Crystallizer and pulls away. 12. Throw the knife switch (#1) in the upper left corner from left to right. The arm swings so the claw is above the Crystallizer. Brief loud buzzing ensues. 13. To the right of the control panel is a lever that resembles those used to switch the cart track. Move this lever (#5) forward. The Crystallizer rotates and electrical discharges move from the claw to the Crystallizer. Several items turn green. 14. When the rotation stops, return knife switch to the left. The claw retreats. 15. Move the claw control knob in the T-slot downward. The arm and claw pick up the finished lifestone crystal and carries it off to the dumbwaiter. Go to the dumbwaiter where you will find the glowing crystal inside. Click on the red button to send the dumbwaiter up, then leave the lab by the door to the Great Hall. There are still areas of the castle that you have not yet explored. Recall that in the mausoleum you found the combination for the locked door in the chemical storage room, so go there. Click on the tapestry covering the access to secret passage #1, go up the ladder and then the rope to the lower parapet, through the Tesla coil room to the frost room below, and into the chemical storage room. The sliders below the handwheel are difficult to see, but upon close scrutiny they can be set to the positions shown in the mausoleum note. Success will be demonstrated when the handwheel turns as you click on it, and the door opens for you to enter. You have seen this room before through one of the secret passage grates. There is a somewhat gruesome optional exercise at this point if you wish to undertake it, otherwise skip this paragraph. Go to the table on the right to read more of Frankenstein's notes, then return to the shelves to the right of the entry door. On one of the shelves are four pink objects in jars; these are human brains. Pick up one, carry it to the apparatus on the right, and place it in the pan above the knife switch. Click on the bird-like probe, which will move to a spot on the brain, then close the knife switch to hear a few last words. The probe withdraws; click on it again for more words. Keep clicking on the probe until the words are repeated. Put the brain back in its jar. You may do this for the other three brains as well. Toward the end of the room opposite the entrance there is another door in the wall on the left. Open this door to find Frankenstein facing you from behind some cages. Animal noises are heard. Approach him for an interchange of invective, after which he goes behind some boxes. Find a desk on which there is another set of notes about a modification of the Resurrection Laboratory equipment. Keep moving around, possibly seeing animals in cages, until Frankenstein appears, calls you an incompetent drunk, and raised his gun to shoot you. Quickly turn right to a door, which after a self-demeaning soliloquy on your part, will open to the 3rd floor hallway. You have been in this hall before when you examined Frankenstein's study and you know there is no way out but the door to the left, which leads to the 2nd floor hallway, where the closest exit is to the top of one of the Great Hall stairs. Where to hide? Well, there are numerous places to go. One of them is into the tunnels at the end of the long pool. Go out into the courtyard and head for the tower. Past the tower is a strangely dressed man with a pronounced accent and a handgun who clearly intends to kill you; quickly turn toward the pool where you find another man, this one with a rifle but with the same dire intention on your life. Rapidly turn right again and hurry back to the castle and the Great Hall. Just before the Great Hall door is the second man who has beat you there carrying his rifle and grim intentions with him, but again if you act quickly you can get into the Hall, where you are temporarily safe. Go up the right stairs. When you get through the door, turn left, move forward to the end of the hallway, turn right, forward, and left again, and head for the door at the end of the hall. This door has been locked up to now, but fortunately is no longer so, though it locks again after you go through it. You have time to look around and see that this is a bedroom, even while one of the men is pounding on the door and shouting threats. You must find and click on a full length mirror, behind which are shadowy movements. The mirror breaks, and in the opening is a young woman who urgently tells you to follow her. As you do so, going after her as quickly as the cursor allows, you pass through tunnels that should be familiar to you from your experiences behind planetary gate I. She tells you her name is Sara Strauss. Eventually you enter some new tunnels, ending up at the mouth of a cave looking out at a sunset. Turn to Sara on the right next to some barrels, on one of which is a cup and a tree branch. Click on the barrels; She says that she knows who you are, offers you the cup for a drink, and moves off. Strangely, in this cave there are shelves with some bottles on the top one. If you are indeed thirsty, click on the cup for a drink, then put it back. You can use the tree limb to knock down a bottle, which will break upon falling unless you first click on the adjacent barrel to push it behind the shelves so the bottle lands safely in it. At this point the order of things tend to become slightly confusing. Keep switching right or left when the action becomes static. Sara speaks several times, as do you, the monster. The disembodied hand shows up in the foliage, frightening Sara. You have the option of throwing a rock at it or not, in either case it withdraws, though you may have to wait a bit for it to do so. Whether or not you use the convenient rock determines whether Sara survives or is shot. Sara wants to get Frankenstein's help, but you want to take her to the mausoleum to show her that he is evil. After this intention is stated, leave this place and travel through the tunnels FFFFRFFRFR to the planetary control unit. Sara questions you a couple times as you go, indicating she is with you. Just before you get to the tunnel entrance you hear gate I conveniently open. Use the control unit to open gate IV and take Sara into the mausoleum. When you get there pull out the three remaining documents from the open drawer; however, your intention of demonstrating evil seems to have backfired, as Sara expresses admiration for Frankenstein, then leaves, stating that she must find him. As you start to follow her out an earthquake hits. Rocks fall, but the tunnel is not blocked, though the ones behind gates I and III are, and the control unit has fallen, blocking the exit tunnel. However, Gate II has been shaken open and when you go to it you find that the rocks formerly blocking it have shifted enough so that you can get by. That is where Sara has gone, so go FFRFF to her, then immediately go up the ladder as she indicates and keep moving up as fast as the cursor will let you. Three times you will have a choice of ladders: the first time take the left one, the second time the right one, and the third time the left one. At the top click on Sara when she reaches for you, and you will end up in the topiary garden. Sara leaves, to look for Frankenstein she says. Move forward and leave the garden through the spiderweb gate. Outside, turn left and place the cursor over the pool so that when you go forward you see the gargoyle and sphere statuary. Click on the latter to move it downward, then go forward to the castle end of the pool to have the gate slide down. Again follow the tunnel to the dock of your previous underwater excursion. Without going to the edge of the dock, look around and discover a bomb and under a bottle on a crate an incriminating note from Judge Rothenbush to Vladimir. Take the note. Somehow Sara is here and it is decided not to touch the bomb and to find Frankenstein. Frankenstein could be in many places in his large castle, but as it happens he is in his observatory. Leave the dock across the six logs to the exit, take the left tunnel, and use the lever on the right wall to open the door to the long pool. Go to the Great Hall, up the stairs to the second floor hallway, up the stairs behind the door near the bedroom to the third floor, right and around the corner into the alcove in which is the door to the study. In the study turn right, and Sara, who must have been with you all the way, goes into the observatory. Follow her in to see Frankenstein gazing out a window. There follows a long emotional conversation between the two of them, in which Frankenstein states he knows of the collusion between the judge and Vladimir and that he put the bomb there to get rid of them. He denies that there are any children involved despite the note thrown at his feet, which he ignores. You hear his footsteps leaving. Go into the study, where he is standing in the doorway. He speaks placatingly that he is going to defuse the bomb, then closes the door and locks it, shouting from the outside that the bomb will go off as planned, and the two of you must stay in these rooms. Return to the observatory and Sara, who is now disillusioned. She is looking out a window and sees children being taken into the dock. Look through the telescope and see this, and recognize Gabrielle, whom you are supposed to have killed and for which deed you have been convicted by Judge Rothenbush and hung. You must get out and try to do something. Back in the study there is a grate high in a wall; you have used grates before to make an escape. This one is too high to reach, but if you move the table on the left (click on it) underneath you can reach it. The grate is locked. Look in the drawer of the table next to the one you just moved to get the key, but when you try to use it you drop it. Move the table again to discover the key in a floor grate, where it is just beyond your reach. On a table in the observatory next to Sara is a magnet that you can use to retrieve the key, and this time you are able to unlock the grate, but the opening is too small for you to crawl through. However, Sara can, and when she gets into the hall she unlocks and opens the door. There is a gunshot. Frankenstein has rigged a deadfall so that opening the door sets it off. Back in the cave when the disembodied hand appeared in the foliage and frightened Sara, you has the opportunity to chase it off by throwing a rock at it; had you done so, the deadfall will kill Sara, but if you had waited for the hand to withdraw on its own, then the hand would have taken the shot and Sara is spared. You must get to the dock. As you open the door to go down the stairs to the second floor an explosion is heard; Frankenstein has set off the bomb. By now you know the way; when you click on the gargoyle and open the door at the end of the long pool, smoke escapes. Hurry to the dock, but you are too late, Gabrielle is dead. But you have made a lifestone crystal, you can bring her back to life! Pick up Gabrielle and carry her to the Great Hall, up the ladder in secret passage #1, up the rope to the lower parapet, and up to the Resurrection Laboratory. When you enter the Laboratory you will be facing the skeleton and a thunderstorm has come up. 1. Turn right and Gabrielle will be on the table on which you yourself came back to life. 2. Now you must get the crystal from the dumbwaiter where it was placed after you made it. Turn left, forward to the right twice, and left. Click on the dumbwaiter grating to move it aside, then on the dumbwaiter to see the glowing crystal. Pick it up and move back. 3. Turn right twice and place the crystal vertically in the holder at the end of the green arm above Gabrielle. 4. Turn left, go forward to the right, then right and you will be at the control panel. Click on the three switches on left side of the panel and they all flip to the right. Click on the two switches on the right side of the panel and they both flip up. Click on the cart track type lever on the left of the panel and the platform carrying Gabrielle rises out of sight. The electricity in the storm must be used to energize the Tesla coil, and that in turn applied to the lifestone crystal. Values and timing are critical. Details are given in the notes that you have been collecting. 5. Turn left from the control panel and move to the periodic table chart, then go down through trapdoor to room below where the Tesla coil is located. 6. Move forward and left to the knife switch, which you must throw to the up position. 7. Go back up to the Resurrection Laboratory and continue up the ladder to the upper parapet. 8. Click on the anemometer to bring up the wind speed gauge. When the indicator is between 15 and 23 (or close), back off and click on the reel of kite cord to release the kite, which will sail out into the lightning. 9. Go down the ladder and through the trapdoor to the Tesla coil switch. Pull the switch down and watch the meter (be patient); when the needle approaches the red area push the switch back up. 10. Return up to the Resurrection Laboratory. 11. Move forward to the right three times, then right, and you will be at the control panel. Click on the three switches on the board left to set them back to the left to complete the life giving process. Watch the concluding video. An epilog follows concerning the principle characters. · After the monster acquires the inventory valise, it accompanies him wherever he goes, even during the precarious ascent of the tower. This inventory always accompanying a protagonist everywhere is an Adventure game phenomenon that one learns to accept. · The only part of the monster one gets to see are brief glimpses of his arms. I for one would like to observe what Frankenstein put together. Apparently it did not faze his daughter. · Why are those three mysterious line plaques found in the secret passages included? · I would like to know what it was that the disembodied hand says. · After the first visit to the dock, one may well wonder about its purpose. The gold bars are never touched, the list of children is gratuitous, as is the appearance of the octopus—though you will get killed if you do not pick up the speargun before entering the water. · You don’t have to put out the fire in the Trophy Room—–at least as far as the appended walkthrough goes. A different one might enter the secret passage that way. · Somewhat along the same line, you may realize that other than for initial exploration the walkthrough does not take you back to several of the secret passages, and if you do, you could get to your destinations by another route. However, game replay with this in mind resulted in sequences not appearing when required for game progress. · Frankenstein makes quite a point of wanting his notes back, but he does not take them when he has Phillip shackled in the dungeon. · The only access to the Resurrection Laboratory at the top of the castle that is shown in the game is via secret passage #1 and the rope to the lower parapet. It is inconceivable that Dr. Frankenstein used this route, yet no other is ever indicated. One would hardly expect him to ride the dumbwaiter. · Having the alternative of setting the game to have Sara live or die seems rather pointless. · The monster must have been recreated with extraordinary strength and agility in order to carry Gabrielle from the dock to the Resurrection Laboratory, including up the rope to the parapet. · A unit such as the Tesla coil will not store energy more than a few milliseconds at most. A capacitor will. · It is my opinion that this game has an unsatisfactory ending, something that I find is characteristic of many Adventure games. It is too abrupt, without a complete conclusion despite the epilog, as though the designers just ran out of inspiration, ambition, or money.